Summer is a busy time for master preserver June Taylor as she transforms the bounty of the farmers market into distinctive preserves, butters, and syrups. An expat, she began preserving fruit in the late 1980s in the tradition of her British heritage. Over the last two decades, she has steadily increased her business while keeping the integrity of her artisan roots. She got her start selling at the Berkeley Farmers Market, and has had a stand at the Ferry Plaza Farmers Market since 2001. 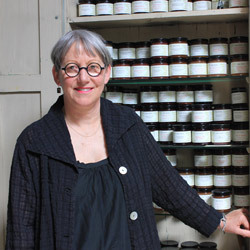 At her Berkeley shop and kitchen, The Still Room, she offers workshops and creates preserves using the best fruit she can find, with no artificial ingredients or added pectin, and minimal amounts of sugar. It would be difficult to identify June’s signature products, because she doesn’t focus on typical preserves, and her selections change from season to season. She is known for combining fruits with herbs, and unusual fruits with more conventional ones, with conserves like Flavor King pluot and anise hyssop, Bing cherry and almond, and Ume plum and Blenheim apricot butter. She takes her inspiration from antique British books on preserving, from her Rockridge backyard garden and her neighbors’ gardens, and by foraging in nature. She prides herself on exposing people to interesting items that surprise and satisfy the palate. She strives for balance in her products, preferring interesting flavors to those that are overly sweet. June’s preserves have a fruit-to-sugar ratio of 4:1, while conventional, store-bought jams and jellies average 2:1. June’s distaste for overly sugared items in the United States is what initially inspired her to start preserving. Farming practices are also very important to June. She prefers to work with farms with integrated farming practices and does not use fruit that was grown using pesticides, insecticides, or fungicides. She strongly believes that traditional methods of growing and preserving fruit are the ideal way to create a quality product with compelling flavors. Having only two full-time assistants, June keeps her production small, and she does the sourcing herself. Some of her products are only available for a limited time. Her varieties are completely dependent on the best that nature and the farmers market have to offer each season. One of the farms is Tory Farms, located in Dinuba, 212 miles outside of San Francisco. 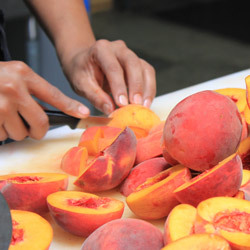 Tory and Rebecca Torosian are best known for their stone fruit in the summer and citrus in the winter. The Torosians and June met at the Ferry Plaza Farmers Market and have been working together for nine years. They are not only partners in business; they are also friends and have a great deal of respect for each other’s craft. In the summer, June keeps busy with “a cascading avalanche of fruit” from Tory Farms and other farmers, such as Blossom Bluff Orchards and Everything Under the Sun. In the winter, when there’s less fruit to keep up with, she focuses on the slower-paced work of candy and marmalade making. She candies the rinds of the citrus fruit she has preserved, aiming for as little waste as possible. 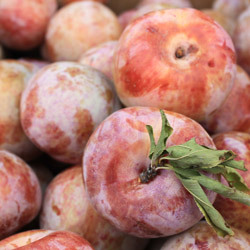 The current drought has created fruit that is smaller and more intense, and ironically, “better for preserving because you’re one step closer to having it concentrated,” says June. Because she works so closely with farmers, however, she shares many of their worries. “I feel like every year we have issues to deal with, and this is a major one for farmers,” she says. 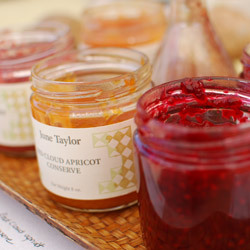 Find June Taylor Company on Saturdays and Tory Farms on Saturdays and Thursdays at the Ferry Plaza Farmers Market. Photos of June Taylor, Tory Farms, and fruit by Ana Valdes. What Does “Artisanal” Mean, Anyway?